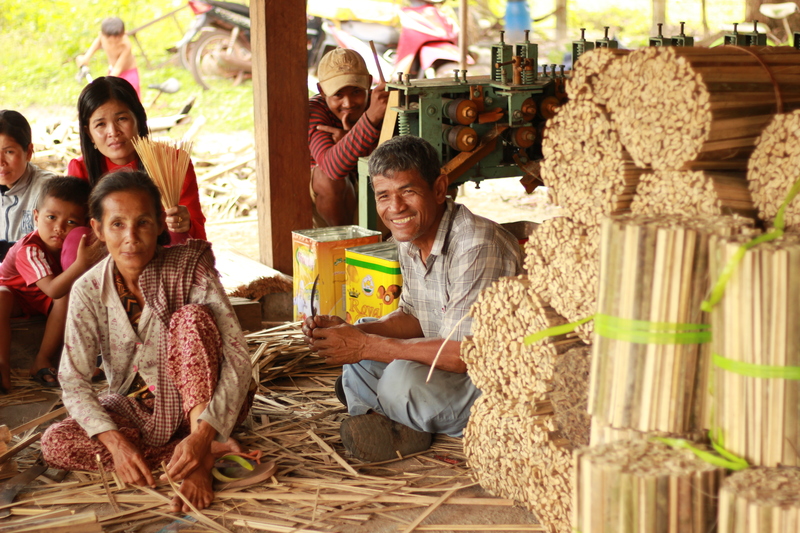 The Rattan & Bamboo team has been supporting community members in Cambodia to improve livelihoods while simultaneously protecting forests. This involves the introduction of new environmental friendly rattan and bamboo production techniques and sustainable harvesting. Increasing income generation of local villagers is one of the key encouragements that will ensure the participation of the community. The WWF team also helps to link their products with the relevant markets. One of the most recent success stories resulting from the tireless efforts of the team came to fruition just six months ago at the Toap Cheang Community Forest and Krang Community. With the successful implementation of the rattan project in these communities, the market demand for rattan products began to increase, but this demand increase led to concern about the sustainable supply in the future. However, the team saw the potential for bamboo to be used in the production to replace rattan, in order to fill the demand sustainably. WWF-Cambodia introduced a boiling facility at a rattan enterprise in Preah Sihanouk province for the purpose of applying an environmentally friendly treatment for rattan and bamboo. The system uses a combination of cooking oil and salt to boil the harvested bamboo and rattan, replacing the diesel application in the conventional method. The initial idea was to continue to make the same products, but replace rattan with bamboo, however, the communities saw the opportunity to combine bamboo and rattan so that the products are a combination of both. This innovative idea--started from three families--will not only reduce pressure of rattan overharvesting but also improve the profit margin due to the relatively cheaper price of bamboo inputs. In addition, this has led to an increase in the production of mid-range quality products (instead of lower range products) that has in turn increased the final sale price. In 2018, WWF will take this successful example and scale up the bamboo production of more families within these communities and will be expanding to other provinces.